Biologists and divers with the Florida Aquarium are releasing more than 3,000 staghorn coral into the Florida Reef Tract. It is the third largest coral barrier reef system in the world. TAMPA, Fla. — For the next week, The Florida Aquarium's biologists and divers will launch a conservation effort to help the Florida Reef Tract fight a rapidly spreading disease that can potentially put this animal at risk of extinction. Divers will release more than 3,000 staghorn corals into the Florida Reef Tract. "It is the most genetically diverse outplanting of new coral ever in the history of Florida," said Roger Germann, CEO and President of the Florida Aquarium. The Florida Aquarium is working with its partners including Florida Fish and Wildlife Conservation Commission, The University of Florida, the Coral Restoration Foundation and Nova Southeastern University. The Florida Reef Tract spans nearly 150 miles from Key Biscayne through the Florida Keys. It is the third largest coral barrier reef system in the world. 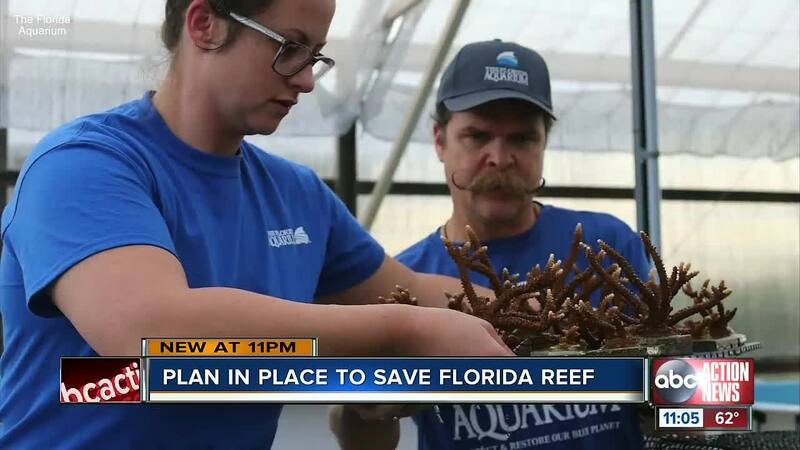 "It's suffering some of the pressures of climate change and water quality and a disease that's running through it so the Florida Aquarium is doing our part to basically repopulate those coral reefs," said Germann. Biologist grew staghorn coral at a conservation campus in Apollo Beach. "By adding 3,000 new genetic individuals to the reef track that's a huge increase in the genetic diversity of the existing staghorn population in Florida," said Keri O'Neil, a Senior Coral Scientist. Ticket sales at the Florida Aquarium and donations pay for conservation efforts like these. "In order to really save this coral reef, we're going to have to do this more and more, work with our partners and make sure we're out there every year replanting more coral," said Germann.